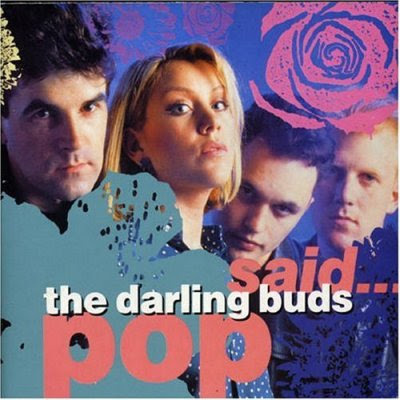 Celebrating The Best Indiepop #5: "The Darling Buds; A Tale Of Two Concerts"
I never liked The Primitives!! I don't know why. I just found them to be a bit too polished, too corporate, too....knowing, like they had been created in some Pop-lab from loose cuttings of (spit! )Transvision Vamp. A lot of my friends liked them but I think they really just liked Tracey. So, it was with some surprise that I found myself falling in love with The Darling Buds, a band once described as Primitives-lite, to the point that, in the wake of the recently demised Smiths, they became, for a period, My Favourite Band. It all began with 'Shame On You'. A friend of mine called Sharon gave me a loan of her copy of the single, telling me that I'd really like it. On first play I wasn't exactly impressed. It sounded like every other girl-fronted Indie band I'd heard in recent times; The Flatmates, The Shop Assistants, The Popguns.....BUT, on repeated playings something broke through my veneer of Indie snobbery. Pretty soon I was collecting up all of their back-catalogue and even began collecting live bootleg cassettes at the Barras, record fairs and from their devoted fanbase somewhat ironically(I guess) named The Skullfuck Crew. I was truly smitten to say the least. I listened to them constantly, compiling tapes of everything I had and perpetually playing them on my Walkman. 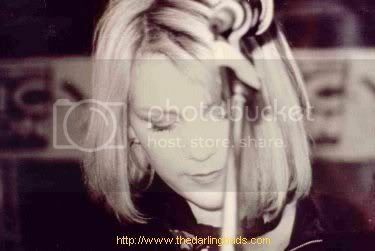 Then one night in late 1988 I got a call from Sharon to say that The Darling Buds were doing a tour to promote their forthcoming debut album and that they would be at the Glasgow Rooftops on the 12th of January 1989. We immediately sent off for tickets....this was going to be IT!!! 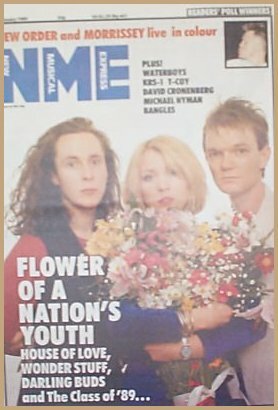 The first edition of the NME in 1989 had on the cover Guy Chadwick(from The House Of Love), Andrea(from The Darling Buds) and The Wonder Stuff's Miles Hunt. What the NME seemed to be saying was; here are the three pop stars who will show the way in 1989, these are the three to put your trust in and who will lead us to the Indie Promised Land. On the 12th of January 1989, the night of the concert, The Darling Buds appeared on Top Of The Pops performing 'Hit The Ground'. We were a little worried that they wouldn't make it up to Scotland for the gig as this was the depths of a particularly hard Winter. Without making an obvious pun, the band really hit the ground running that night....It was absolute pandemonium when they took to the stage. The crowd were really up for it, confetti exploded from everywhere....this was a trait of the Skullfuck Crew, and they launched straight into 'Valentine'. I was going ballistic at the front, and Andrea was literally within touching distance. My favourite song of theirs was 'Big Head' and I hollered for it at every opportunity. When Andrea first took a breath and stooped down to the drum-riser for a drink of water I seized my chance; "ANDREA!! !.....BIG HEAD!!!.....PLEASE!!!!" and put my hands into a kind of prayer gesture. She looked right at me, smiled and nodded. Five songs later, "You gotta great big head...." I whooped with joy and bounced like a madman. Andrea even looked down at me to see if I was enjoying it....I was!!! It was a brilliant show....both audience and band really seemed to enjoy it. I thought it was SPECTACULAR....."Thanks, goodnight, we'll see you again", and Andrea was off leaving Harley riffing alone. I was knackered!! But totally elated. I had virtually no voice left, I felt like I'd shattered a few vertebrae, and it looked like someone had poured an entire swimmingpool of water over me. As we stepped out into the severely freezing Glasgow night, so much steam was rising from me I looked like Johnny Storm. The journey back to Bannockburn consisted of us all jabbering away at how great it had been, they had played every song we knew plus songs from the forthcoming debut album. I couldn't sleep that night, running and re-running the show over and over in my head. It would go down in history as one of my favourite concerts of all time. A couple of days later I received a bootleg cassette of the gig and welded it into my Walkman. It became part of my DNA. Two weeks later, the debut album 'Pop Said' was released.... 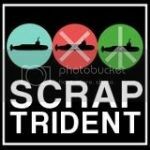 Strewth!!! What a disappointment! It just sounded totally flat. I don't mean out of tune, I mean lifeless, over-polished, too smooth. Where was all the excitement of the early singles and the bootleg tapes? I was dejected. I threw the CD across the room in disgust. After a few plays it started to grow on me, and eventually I came to really like it realising that if I hadn't had all those bootlegs or seen them live then I would probably have thought the album was brilliant. It ended up being my second favourite album of 1989 and practically soundtracked that year. In the Summer of 1989 The Stone Roses released their eponymous debut album and overnight the rules of Indiepop were rewritten. The Darling Buds and The House Of Love suddenly started to sound very much like last year's thing. The Wonder Stuff would survive, but only by becoming a kind of comedy-indie band, a million miles away from 'Unbearable' and 'Give Give Give Me More More More'. By the time Christmas came around and the twin-headed Roses/Mondays Madchester juggernaut was in full throttle, a lot of Indie bands either perished or adopted dance-grooves to survive. For some(Primal Scream) it worked, for others(The Soup Dragons, The Farm) it was a tad embarrasing. The Darling Buds second album 'Crawdaddy' released in 1990 saw them add dance beats and remixes, it kind of worked, sounding like a proto-Saint Etienne but it just didn't suit them at all really. In September 1990 I got a call that The Darling Buds were playing King Tuts in Glasgow and so once again we decided to go. This time there was no exciting build up, only three of us(me, Douglas and Sharon) went, and even they only went because I said I'd pay them in. The concert couldn't have been more different from the first. The audience just ambled about, there was no moshpit, the songs were greeted with muted applause, businessmen types in suits giggled like schoolboys when ever Andrea said anything suggestive....the whole gig was like some massive shrug of indifference. The only highlight was the fact that new song 'Fall' from the second album sounded AMAZING, a huge, trippy, dreamlike groove that received the warmest response from the crowd.....but you could sense it was all over. I never saw them again, and only bought their third album 'Erotica'('conveniently' released at the same time as Madonna's album 'Erotica'....hmmmm!!!) earlier this year. The gig seemed to signal the end of an era.......no longer did we all pile into cars and rush enthusiastically to see bands we'd only read about in the NME. Concerts no longer became twice of thrice weekly events, but instead we just went to see bands we knew whenever they played in Scotland. It felt like a part of my youthful gig-going experience died that night. The night before I sat down to write this Blog I went up into the attic and found the live Bootleg cassette of the Rooftops gig. I realised I probably hadn't played it in close on 18 years. I felt a little nervous...it was like being asked to meet an old flame. As the tape played, the memories came flooding back...I just sat there grinning. You can actually hear me on the tape yelling for 'Big Head' several times, and you can hear me whooping when the song begins. From a historical perspective their songs sound SO good that I think I may just go and play their entire ouvre in chronological order! So...Yeah, I never liked The Primitives. But I LOVED The Darling Buds!!! The Bootleg cassette complete with incorrect date....it was 1989, not 1988. While there is a Darling Buds Myspace, it is a fan site and has been dormant for about 3 years now.